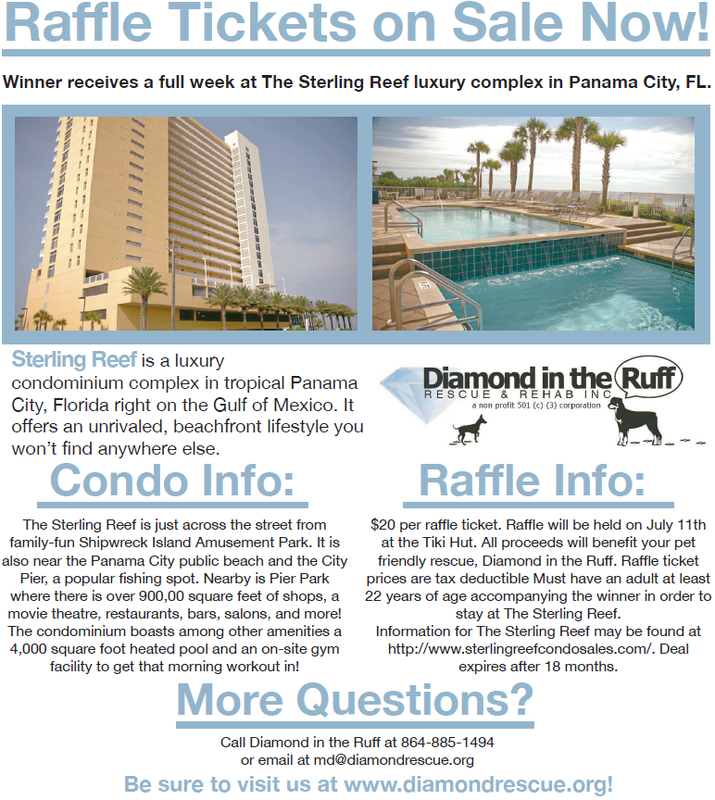 Panama City Vacation Raffle - Diamond in the Ruff Rescue & Rehab, Inc.
We are raffling off a full week (7 nights) in the Sterling Reef luxury condo right off the Gulf Coast in Panama City. Both seasonal and off-season dates are available for all your vacation desires. Pictures and more information about the Sterling Reef Condominium Complex can be found by CLICKING HERE. This vacation package is estimated around $2,100, and only 250 tickets will be sold! Tickets are $20 (tax deductible), and the flyer for the raffle can be found by CLICKING HERE. The drawing will be held during our fundraiser event on July 11th at the Tiki Hut. You do not need to be present to win; we will contact the winner by phone or email.